I saw a photo of some grain sack baskets and it inspired me. So I decided to make some myself. 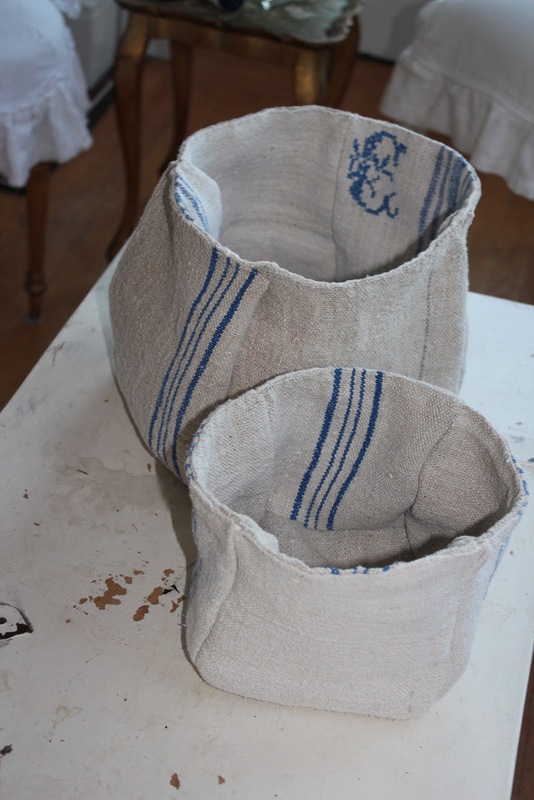 I made these reversible baskets out of 100 plus year old hand loomed hemp linen. 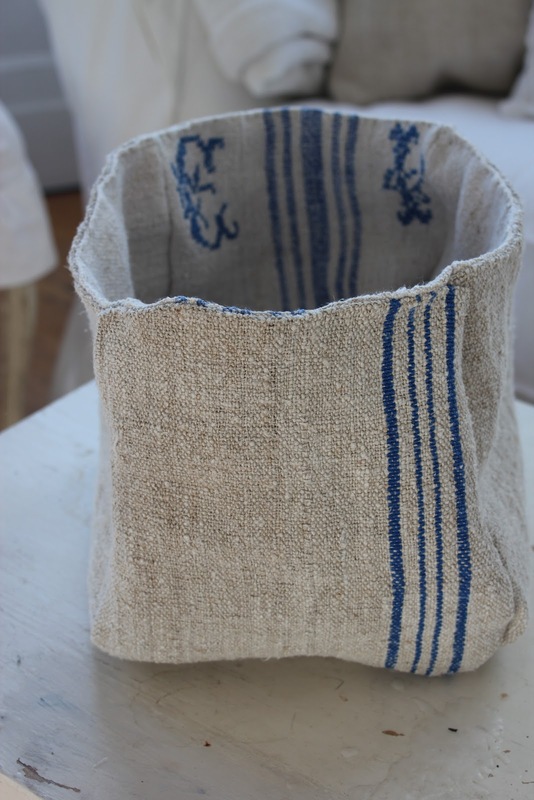 One of the sacks has faded blue stripes and it is one of my very favorites. The initials CI were how the grain house marked the sacks to carry their product in. You could use these as a cachepot, or to store cosmetics. I thought they would be cute on a shelf in a bathroom. This is the larger of the two. At 8.5 inches tall, it turned out bigger than I expected. This is the smaller of the two, same fabrics though. They are available in my etsy store. I hope to add a small version tomorrow. Fun project for a Saturday afternoon. Welcome to my new followers this week. Thanks for all of your kind words. PS thank you also for your prayers for our little Ella. It went well and she is resting at home. Hi ~~ They are sooo...adorable. Love them. I just love your grainsack baskets...so cute. I just read about your sweet Ella and will keep her in my prayers. Those sacks are A-DOR-ABLE! So glad you found me so I can follow back. I need to check out your ETSY! They are so fabulous - LOVE the fabric!!! Thanks for following my blog and for the nice comment! I love the things in your Etsy shop! 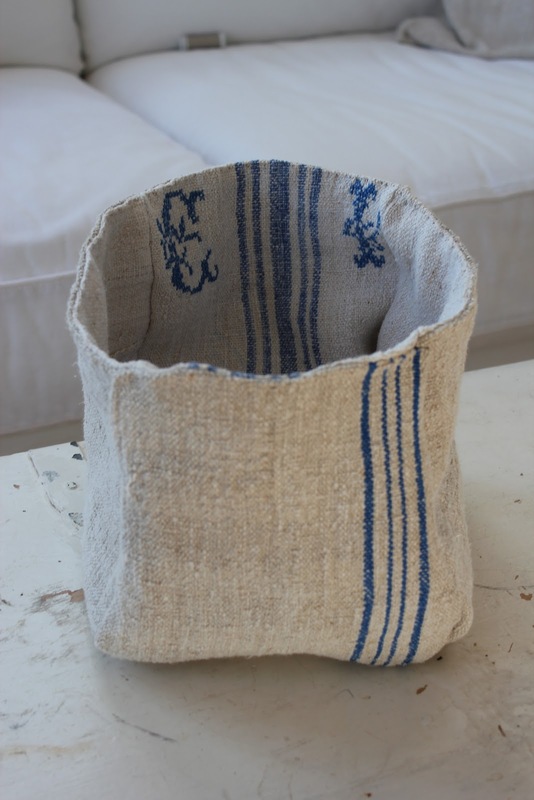 These grain sack baskets are so cute! What a lovely idea and with the hydrangea just wonderful, oh and I have been drooling over the bed headboard in you blog header! and you´re even on pinterest.will look you up.but I am depressed..can´t seem to install the pin it button on my mac,do you know how to? ?so many nice pics to pin "out there". Oh how I Love, love, love these. You are so talented. Hello from your newest follower. These are really beautiful! 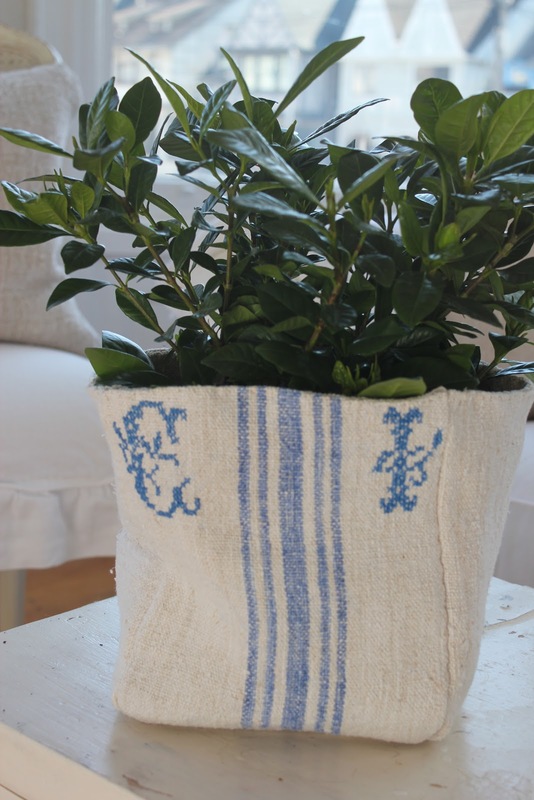 I just came back from France last month with a lot of jute grain sacks and had no idea what I was going to do with them - lots like I've now got something to keep me occupied!